Rep. Frank Wolf (R., Va.) revealed at an event on Monday that his office was anonymously informed about the CIA employee, who is purportedly facing an internal backlash after refusing to sign a legal document barring him from publicly or privately discussing events surrounding the Benghazi attack. "The reports on the NDA are accurate. We’re getting people who call," Wolf said Monday during an event marking the launch of the Citizens' Commission on Benghazi, a panel of former military and intelligence officials who are investigating unanswered questions surrounding the Benghazi incident. "My office received a call from a man saying that he knew a CIA employee who has retained legal counsel because he has refused to sign an additional NDA regarding the Sept. 11, 2012, events in Benghazi," Wolf said in Sept. 9 remarks at a panel discussion hosted by Judicial Watch. "I called the law firm and spoke with CIA employee’s attorney who confirmed that her client is having an issue with the agency and the firm is trying to address it," Wolf said. "Based on my past experiences with the CIA, which is headquartered in my congressional district, I am not at all confident that these efforts will be successful." The NDA agreements are meant to instill fear in employees and stop them from speaking "to the media or Congress," Wolf said on Monday. The CIA declined to comment directly on Wolf’s charges, but forwarded the Washington Free Beacon a letter sent to Congress from CIA Director John Brennan in which he denies charges that the agency has forced employees to sign NDAs and submit to polygraph tests. "I want to assure you that I will not tolerate any effort to prevent our intelligence oversight committee from doing their jobs," Brennan hand wrote at the bottom of the letter. The CIA reiterated its denial in a Tuesday call to a Free Beacon reporter, calling Wolf's allegations "categorically false." Issa says that the State Department "obstructed" congressional investigators, was "not comprehensive" in nature, "did not conduct thorough interviews," and that more senior officials were not held to account. "The ARB was not fully independent," Issa said in a statement. "The panel did not exhaustively examine failures and it has led to an unacceptable lack of accountability." "While Ambassador [Thomas] Pickering and Admiral [Michael] Mullen have honorably served their country, the families of victims and the American people continue to wait for more conclusive answers about how our government left our own personnel so vulnerable and alone the night of the attack," Issa said. The newly formed Citizens' Commission on Benghazi has similar goals as congressional investigators but is not confined by rules governing the legislative body, speakers at the event said. Retired Air Force Col. Richard Brauer, cofounder of the group Special Operations Speaks, said the committee would aim to find out why U.S. military assets were ordered to "stand down" during the Benghazi attack. "We’re tired of the lies and the cover-up that continues to this day," Brauer said. "Who gave the order" to stand down, "to remain in place in Tripoli and the other locations and do nothing. When was this order given and why?" "Forces were available on that very night, likely champing at the bit, but they were told to stand down," he said. "These are words that will live in infamy." 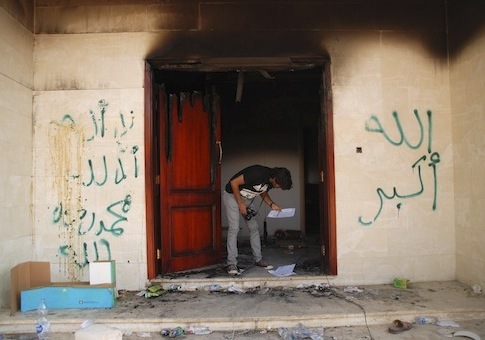 This entry was posted in National Security and tagged Benghazi. Bookmark the permalink.